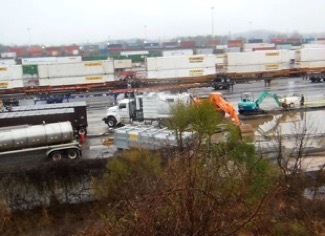 Fuel from an underground pipeline at a locomotive intermodal yard leaked into a stormwater and discharged to a stream discharging through a subdivision. Remtech was contracted to: determine the location of the leak; contain, recover, and support leak repair operations; handle stormwater contact water; and contain and recover fuel from the subdivision. 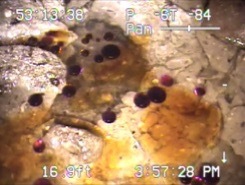 A 3,500 foot underground cased fuel line leak infiltration point into a stormsewer was located by isolating sections of the stormsewer with 30” expansion plugs, inspecting manholes, conductive metal tracing, CCTV camera inspections, vacuum truck potholing, ground penetrating radar, and tracer gas. Fuel was vacuumed from the line with pigs under pressure and vacuum. A total of four 20 ft deep test pits were excavated to uncover the pipe. The leaking segment of fuel carrier pipe was located by installing valves at two test pits and pressure testing each section. 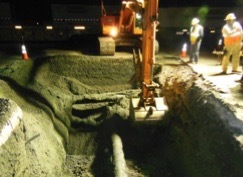 An estimated 350 ft of new pipe was replaced & welded by a piping contractor and x-rayed and pressure tested by Remtech. 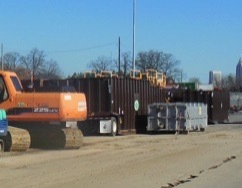 Contaminated soil was excavated and disposed of at a permitted facility. Groundwater recovery wells were installed and the test pits were backfilled with gravel and clean soil. 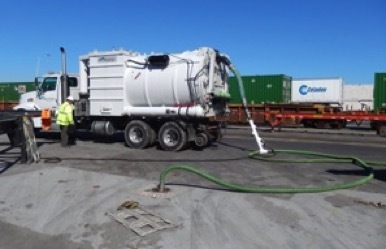 Over 1 million gallons of stormwater and petroleum contact water were pumped from the test pits and disposed of at the railyard’s onsite treatment plant or at an offsite pretreatment facility. 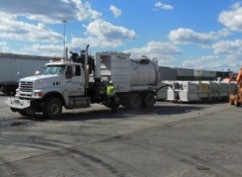 Remtech conducted two-phase vacuum extraction operations and stormsewer cleaning operations. subdivision and facilitated smart test pit locations to validate the actual leak location. 2. Contaminated stormwater treatment of an estimated 250,000 gallons of with HC-2000 discharged into an abandoned tank farm saved an estimated $50,000. 3. Installing horizontal leg total fluids extraction wells during backfill of test pits was more cost-effective that post backfill installation.